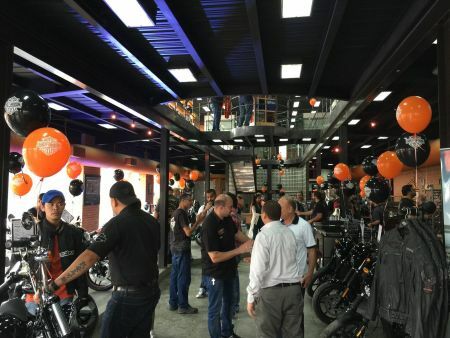 The H-D Kuwait Open House event was held on Saturday October 31st from 10:00 AM – 4:30 PM. The Kuwait H.O.G.® Chapter Member’s Gathered at the Caribou Coffee shop at Shara Golf Club and rolled out at 10:00am for the parade the H-D® Kuwait showroom. Visitors stood the chance to win great Harley® gifts when entering the draw of the day, among other great fulfilled activities such as bike games, Harley®knowledge quiz and top custom motorcycle in the house. The highlight of the event of course was the great MY16 Motorcycle line up launch. Two new hard-hitting Dark Custom models, the most powerful cruiser lineup in company history, and a broad range of performance and styling enhancements throughout the range highlight Harley-Davidson’s powerful new model lineup for 2016. New Iron 883™ and Forty-Eight® models assert Harley-Davidson’s Dark Custom leadership with motorcycles inspired by the rebellious spirit of the past updated with modern design and new suspensions that put a little extra smooth in the Harley-Davidson soul. New S series limited - edition cruisers feature big power and cutting-edge style. The Fat Boy® S and Softail Slim® S combine rich finishes with the impressive Screamin’ Eagle Twin Cam 110 engine to deliver head-turning style and performance. Previously only available in Harley-Davidson Touring bikes, the High Output Twin Cam 103™ engines upgrade the power for all Softail® models rounding out the most powerful cruiser lineup in Harley-Davidson history. Project RUSHMORE’s touring revolution expands with the return of the Road Glide® Ultra motorcycle. The new Iron 883 is intentionally raw and rough around the edges, with a modern design inspired by garage-built bobbers past and present. All-new front and adjustable rear suspension, lighter-weight mag wheels and improved seating increase comfort and control to smooth the road ahead. The new Forty-Eight achieves its menacing stance with a burly front tire, new mag wheels and a massive front end with new 49mm forks, and also benefits from improved adjustable rear suspension and seating. Retro styling cues and a perfect ratio of black, color and chrome give this bike a bold visual presence. Riders navigating rough and tumble urban streets on the lean and nimble Harley-Davidson Street® 750 model will appreciate the improved confidence from new front and rear braking systems (United Kingdom only). See separate Dark Custom release for details. Rear tires will beg for mercy with the most powerful cruiser model lineup in Harley-Davidson history. Powered by the Screamin’ Eagle Twin Cam 110 engine, the new Fat Boy S and Softail Slim S cruisers deliver power and performance once reserved for Custom Vehicle Operations (CVO) models. Both limited-edition models feature dark styling for menacing looks that match their muscle. The Softail Slim S is available in a new Olive Gold Denim color with military-inspired styling, paying homage to the post-war customs that launched the bobber movement. Harley-Davidson gives more riders a dose of Project RUSHMORE performance by making the High Output Twin Cam 103 engine standard in every other 2016 Softail model. See separate Cruiser release for details. There’s more cruiser news in 2016; for the first time ever electronic cruise control is available on all Harley-Davidson Softail models. The convenience of Harley-Davidson electronic cruise control, enabled by new electronic throttle control, is standard equipment on 2016 Heritage Softail® Classic, Softail® Deluxe, Fat Boy S and Softail Slim S models and available as an accessory for all other 2016 Softail models. progressive rate springs for consistent feel throughout the compression and extension range of the suspension. The triple-rate spring and oil lock allows the forks to resist wheel hop under hard braking. A two-year absence from the Harley-Davidson Touring line was time well spent infusing the Road Glide Ultra with enhanced style, outstanding aerodynamics and optimized touring ergonomics for rider and passenger– the full influence of the customer-led Project RUSHMORE product-development effort. Propelled by the unrelenting performance of the Twin-Cooled™ High Output Twin Cam 103™ powertrain, the new Road Glide Ultra will exceed the expectations of the most demanding touring motorcyclist. See separate Road Glide Ultra release for details. Combining nostalgic style with smooth, modern Softail performance, the Heritage Softail Classic receives refreshed styling for 2016 plus the High Output Twin Cam 103 powertrain, standard electronic cruise control, and a new and improved saddlebag support structure. See separate Cruiser release for details.